Bang on a Can All-Stars, 2000s version. Source: bangonacan.org; click to go there. It wasn’t until about 1995 that I really tapped into avant-garde music, so I have a romanticized image of the 1980s “downtown” scene. I arrived for the tail end of that era. The Knitting Factory was feeling the decay that would eventually transform it into a rock club. John Zorn and other avant-jazz stars were starting to become accepted by the critics (if not the general jazz public). Still, with lots of recent history to catch up on, I had a terrific adventure backtracking the careers of folks like Tim Berne, Bobby Previte, and Jim Black. Bang on a Can emerged from that era as well, but not quite from the same direction. 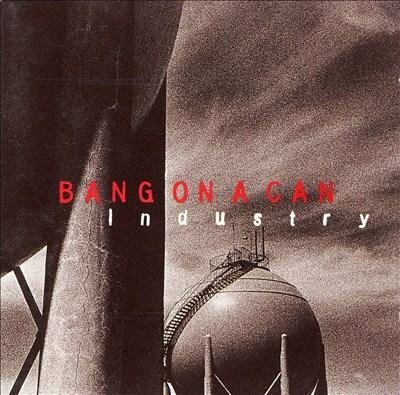 Liner notes to Industry (Sony Classical, 1995) describe the 1987 debut of the Bang on a Can festival as an attempt to create a polyglot musical direction, one that bridged the tuxedos of uptown new-classical with the black T-shirts of the downtown scene. Those recordings come from an intermediate stage, when the Bang on a Can Festival was lesser-known to the wider world but accepted enough to drive a recording deal with Sony. For me, the CDs were a good lesson in the group’s aesthetics and goals. In the past decade, I’ve heard a lot of new-classical music that seems to fit the Bang on a Can mold, where minimalism, virtuosity, and even improvisation collide, and now I know at least one force that helped get that message out. In particular, a lot of new music is loaded up with percussion, sometimes to lend a rock-like heartbeat, sometimes to just plain bash and thrill. Industry shows how strong that trend already was prior to the ’90s. “Lick,” by Bang on a Can co-founder Julia Wolfe, opens the album with strident blips that build into something like a rock rhythm (Mark Stewart’s electric guitar certainly helps push that suggestion). Built of various types of pounding that eventually emerge in melodic forms, it’s an engaging piece that grabs me like a good jazz track would. “The Anvil Chorus” is simply all percussion. David Lang composed the piece, then left Steven Schick to pick just which junk-percussion items would be making the sounds — a nice idea that acknowledges the importance of percussion and the wide flea market of sounds waiting to be tapped. Two compositions take some inspiration from the early Soviet practice of trying to replicate pounding, steaming factory sounds in music. One is “Industry,” a somber Michael Gordon piece performed by cellist Maya Beiser. But the one that’s particularly effective is Annie Gosfield’s “The Manufacture of Tangled Ivory.” It uses a sampling keyboard where some notes are “tuned” to industrial clangs or to muffled, prepared-piano clacking. That lends a percussive sound to the keyboard solo that starts the piece — and then, when the ensemble kicks in like a fast conveyer belt, the percussive piano, guitar, and bass sounds augment the outright percussion for what, indeed, comes across like the sound of a factory. Pianist Lisa Moore gets another percussive turn on Frederic Rzewski‘s “Piano Piece No. IV.” While it’s got some rich melody and some serious classical-music flutters and runs, it’s also full of pecking, poking, and two-handed jackhammering. A regally lyrical passage might give way to a sudden near-tuneless pounding — followed by a very tuneful pounding in the higher registers, like a small spoon delicately cracking an egg. Another element often found in modern classical music, and even in improvisation, is process. Louis Andriessen‘s “Hocketus” has two identical sextets playing one chord at a time in strict alternating patterns: Team A plays, then holds silent as Team B plays. On the CD, one sextet is in each speaker, so you get the ping-pong effect of the music bouncing back and forth, eventually in rapid patter that creates long rhythmic phrases. After several minutes, the music feels purely percussive. The exact notes being hit become secondary to their timing; by altering which instruments’ sounds dominate, Andriessen creates different sounds, but you’re not trying to follow any melodic thread, not until the saxophones start building one in the end. 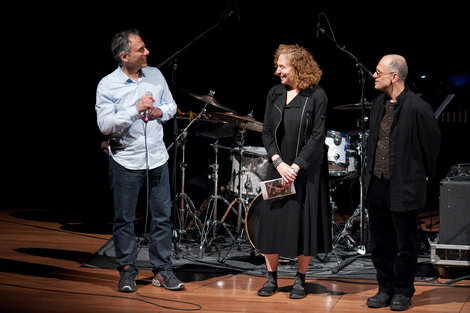 Bang on a Can founders Gordon, Wolfe, and Lang, at the 25th anniversary concert in 2012. Photo by Stephanie Berger; source: bangonacan.org — click to go there. I’ve seen Andriessen’s name but never realized he was such a patron saint for Bang on a Can’s cause, a composer “versed in the European modernist tradition but [who] recognized that rock ‘n’ roll existed,” as Wolfe, Gordon, and Lang (Bang on a Can’s founders) write in the Industry liner notes. 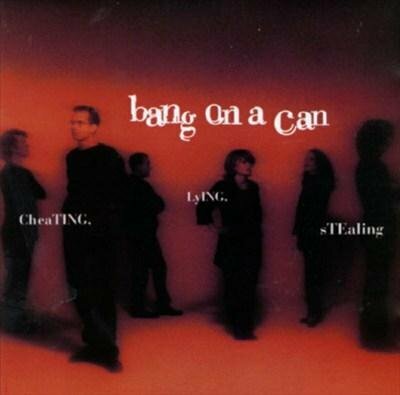 To me, as a latecomer, Bang on a Can itself has always been a touchstone for new-classical music; it’s strangely refreshing to think of the outfit as the spunky new kid looking for sympathetic ears out in the classical world. In classical music, you’ll have this amazing musician, but he sits in a chair or stands still. There’s no visual element, no show. In rock bands, it’s all show. Since we began the Bang on a Can festivals in 1987, we have merged and synthesized these worlds, putting together programs of seemingly contradictory pieces: gutsy, funky, highly energetic, sound-world stretching music that takes in influences from rock, jazz, folk, world music, and technology. The track where those principles particularly shine is “Arapua,” by Hermeto Pascoal — an exciting, screeching free-jazz tumult that lets the band really tear it up while never fully giving way to abandon. It’s driven by big piano chords and some searing electric guitar, including a whole patch of chord strumming that plays out like a solo. Evan Ziporyn goes nuts on bass clarinet above the tumult. That’s how it’s done! It’s a comfort to listen to this music and read these liner notes knowing that Bang on a Can’s ideas and experiments won out in the end. Artists have embraced the idea of letting classical music absorb modern influences rather than the other way around, and the resulting works are rich and plentiful — you just have to find the right places to look. The Bay Area’s Switchboard Music Festival, which I’ve mentioned here but never actually attended, would be a perfect example. Now I can’t wait to go. Battlehooch plays at Slim’s on Friday, Jan. 10, 2014. Last year, the rock band Battlehooch talked about making their next full-length album their biggest effort yet, and they weren’t kidding. Hot Lungs is a terrific rock album packed with sonic surprises out of all the instruments, a polished take on the sextet’s usual avant-garde take on pop-rock. It’s catchy, driven, funky music that does indeed rock — in fact, it represents the directions I wish classic rock had taken. 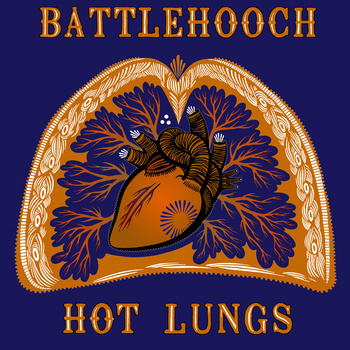 As a band, Battlehooch is full of bouncing-off-walls craziness and twisted creativity. Even the simpler songs, such as the good ol’ rock rhythm of “Hope,” are full of creative tricks — a random sitar riff, or jangly rapid-fire guitar playing the chords, or a sudden shift into a minor key. It’s just a two-and-a-half minute song, but there’s a lot packed into it; that’s typical of this band, and they took special pride in loading up these kinds of production goodies on the album. They turn up the drama for a more cerebral kind of rocking-out on tracks like “Yea, That,” which features a colossal break led by fast, heavy-thumping drums and “Calisteniks,” which comes across as a soaring, serious-rock-anthem kind of song. On the more pop side, “Seraphim” uses tight harmony vocals, flute, and old-timey piano to produce an upbeat yet serious piece of post-Beatles pop. And funk attitude crops up on “This Patience” and “Organic,” which fill the sound with gloopy bass and spastic synth effects, respectively. Battlehooch is a find. They’re good musicians and creative songwriters who want to rock out but don’t want to fit into any convenient mold. Hopefully, Hot Lungs, which came out in February, is getting them some well deserved attention. Cory Wright plays Sat., Feb. 1, 2014 at Duende (Oakland), a double CD-release-party with Aram Shelton’s Ton Trio II. 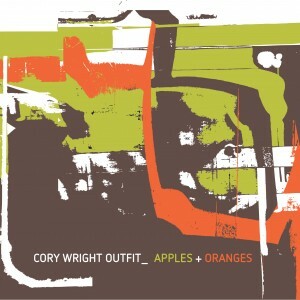 Playful twists on conventional jazz pepper Apples + Oranges, the new album from Bay Area sax/clarinet player Cory Wright and his quintet of locals. It’s a free-jazz album at heart, with lots of room for improvisation and plenty of unconventional structure in the songs. But it all stems from a sunny disposition that colors the modern bebop composing, producing a great session overall. “Whaticism” is a perky and upright bit of swinging whimsy, opening with a jaunty sound. The horns act as the chord instrument, backing up each solo with little written-out phrases or, in the case of the bass solo, a repeated joint squeal. “Low Impact Critter” takes a less jazzy approach, with each instrument pecking sparsely in rapid-fire tradeoffs to create the skeleton of a swing. Later, it’s got flute, clarinet, and trombone mixing it up for a drumless improvisation that’s a lot of fun. “The Sea and Space” is slow but bright, Wright’s clarinet proudly fluttering over a minor-key composition with a catchy bass rhythm and calm lines from the horns. It ends with a hard-driven groove backing Ewing’s trombone solo. Everything wraps up with “St. Bruno’s Purview,” a showy tune with hints of old-timey melody. It features some throaty, burbly clarinet moments — a complement to two other “St. Bruno’s”-titled tracks that serve as short interludes. The most drastic mood shift comes with the 11-minute “Eyedrop,” an exercise in sparse improvisation. Its opening themes are small modern-classical scribbles, spaced apart by quiet, crawling improv segments, one of which eventually takes over to form a slowly jazz-oriented improvising over small, composed outlines. It’s gutsy to take up so much of the album with an experimental piece, but it’s also a way to show off another side of the high-caliber band assembled here. Mezzacappa’s bass solo, over slowly cascading horn notes, is a nice lead-in to the song’s final theme. “Eyedrop” might seem like a speed bump to some listeners who tune in more easily to the overly jazzy tracks, like an orange among the apples, but I’m happy to take them all in together. Ritual is a bustling set of short compositions that draw a big-horned big-band sound out of a mid-sized ensemble. Even lacking the size, it’s got that big-band character, with forceful melodies barked out by the horns, and snatches of violin or electric guitar popping up against the strident drums. It’s relentlessly happy (even the slower and sadder songs have a playful feeling to them) and nice and loud. It’s all in service to David Dominique’s compositions, which include nooks, crannies, and trap doors where the players get to improvise. A jazz composition is a malleable creature by nature, “the same song a million times in different ways,” as Stephin Merritt once put it. But there’s a formula that turns the idea inside-out — one where the sanctity of the composition is written in stone, but the stone says you get to doodle around the margins. That approach is closer to the through-composed model of classical music or even some prog rock, and it produces some fun results here. Some of the most interesting moments on Ritual crop up in the form of group improvising. 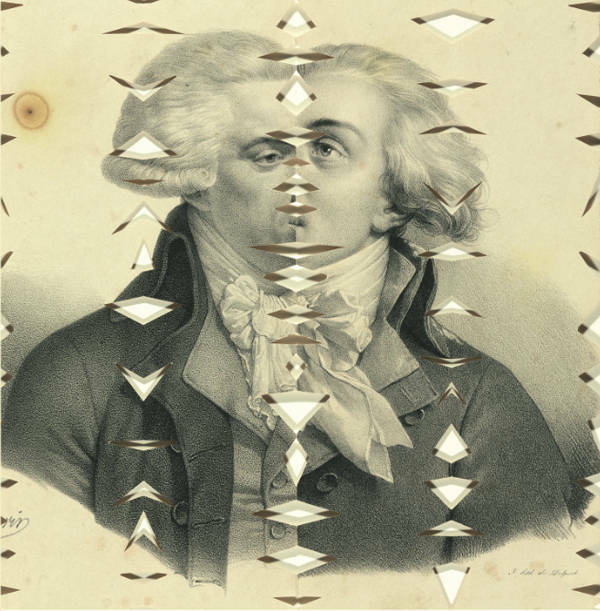 “Mulatto Shuffle” dissolves unexpectedly into a disassociated space, a quiet break before rebuilding into a new form. (Most of the songs flit from one non-recurring theme to another.) “Ritual 2/Dirge,” the only truly sparse song on the album, drifts purposefully, driven by small percussion outbursts and, later, an insistent flute solo — it’s different from the others, and it’s really nice. Playing modern jazz means being willing to risk painting yourself into a corner, so to speak, and that’s what I like about “Ritual 4/Release.” After a manic opening, powered by hard-rocking drums, it phases into an improv breakdown that keeps trying to restart, with a couple of horns quietly playing the next theme before the rest of the group pulls things back into a quiet, artsy place — a game that eventually resolves, but you get the feeling the band has to work at finding a way out. Check it all out on Bandcamp. Actually, Lisa Mezzacappa herself didn’t appear on NPR; her albums did, in a review and mini-profile by Andrew Gilbert for KQED-FM’s California Report. Gilbert reviews Mezzacappa’s trio album, X Marks the Question, and the new one from the Bait & Switch quartet, Comeuppance. Always nice to see good local music get some love from local media. Check it out here. There’s something comforting about the analog synth and Moog beats that fortify Haas/Moreno. That might be the nostalgia talking. It’s hard to hear those synths and not think of ’70s UFO documentaries. But Haas/Moreno doesn’t feel like a throwback. It’s informed by the dance music of the ’00s, full of squelchy, understated beats that might soothe but aren’t going for the spacey relaxation of ’70s “space music” (the less saccharine precursor to new age, and the electronic foil to Windham Hill). He also adds quite a few world-music influences to the beats, elements that I don’t remember being that common in the early days of electronic music. David Moreno is responsible for those sounds, and he’s complemented by Andy Haas’ saxophone. Haas has become a specialist in that genre of Whatever-I-Feel-Like-Playing, often coming up with excitingly abrasive improvisations, but here, he’s offering melodic soloing that’s sometimes even comforting, augmented by reverb and other, more sophisticated electronics effects, to create an extra layer of atmosphere. You get the full effect right away with “Sequence Green,” the upbeat opener that’s equal parts Kraftwerk doodling, planetarium effects, and jazz sax. “Amplifier Red,” soon after, presents an exotic beat overlaid with Middle Eastern-tinged sax. On the less relaxing side, there’s the curtain of droning horns on “Oscillator Magenta,” a backing laid down by Haas as Moreno plays the soloist, dealing those thick Moog notes. Most of Side A is upbeat, with tracks that fly by. Maybe it’s greedy of me to wish the songs were longer; as pleasing as they are, they might wear out if they went eight or 10 minutes. A couple of middle tracks slow things down considerably, including the second half of “Generator Yellow,” which is about sleepy atmosphere and Haas’ placid sax lullabies. Things perk up later on “Multiplier Grey,” where a rocking little beat offers some space for Haas to have ragged fun on the sax. The LP is printed in a limited edition of 100. Downtown Music Gallery had at least one, at this writing. David Moreno, by the way, is a visual artist and (like Haas) works at New York’s MoMA for his day job. MoMA recently published an enlightening interview about his work. 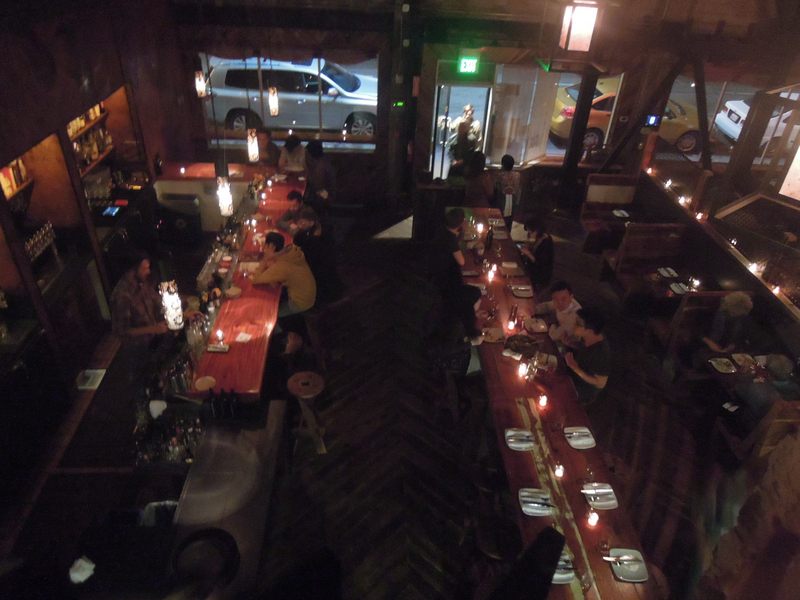 Duende’s dining area: The view from the music loft. 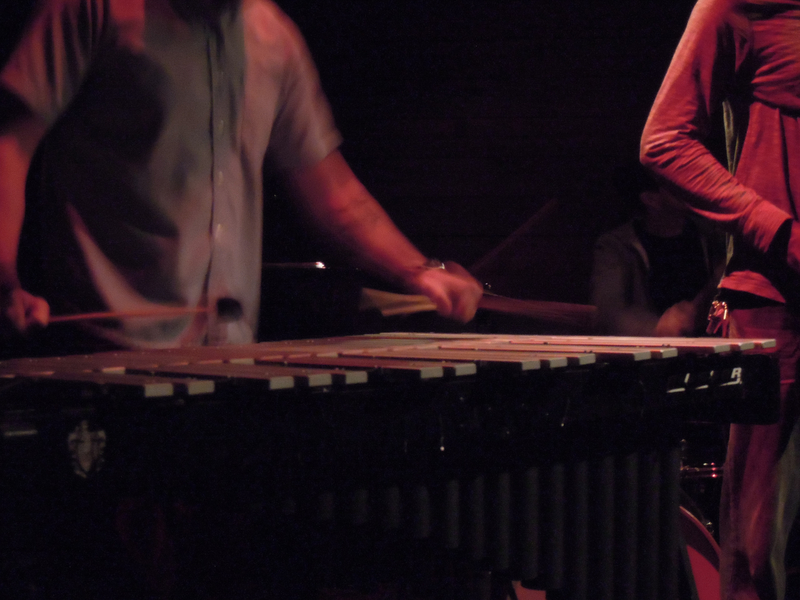 Every other Monday at Duende, the musicians’ collective of the Oakland Freedom Jazz Society takes over over the restaurant’s music loft — a continuation of a series formerly held at The Layover. They present some outstanding local music along with some jazz vinyl DJ’ing before the show and between sets. The vinyl part shouldn’t be underestimated. I didn’t look through the crate they brought, but it seemed like a pretty deep cut of history. Between sets on the night I attended, the musicians were marveling at the early, early Rahsaan Roland Kirk LP that was spinning. Overall, the evening has the vibe of a cozy jazz hangout, complete with really good food and wine downstairs. I’m glad I finally made it out there a couple of Mondays ago. 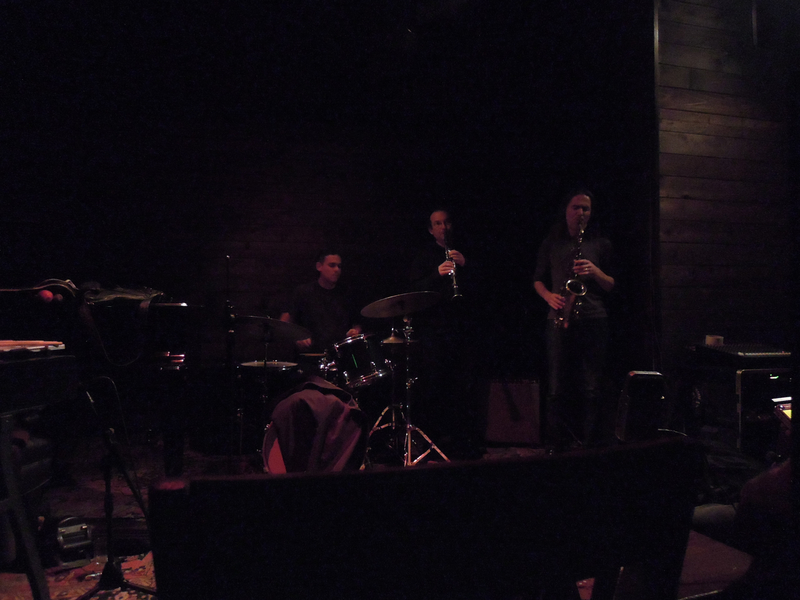 Both bands that night played improvised music in jazz settings. The first set was by the BAG Trio — Vijay Anderson (drums), Sheldon Brown (sax), and Ben Goldberg (clarinet), who have been playing in this configuration for a while. Anderson set down an aggressive groove while Goldberg and Brown wandered jointly, often pushing each other’s energy level up to a breaking point, then receding. One of these surges ended in both of them playing long, shrill tones — kind of a guitar-hero climax that was followed by babbling quick notes to bring the mood back to earth. I found myself paying the most attention to Anderson, though, his quick hands doing some impossibly fast clacketing to lay down those aggressive rhythms. The second set, by the Darren Johnston Quintet, was just what a late-night set ought to be — maybe less white-hot, but still intense, with David Boyce’s sax and Johnston’s trumpet jamming over vibraphone harmonies. The music settled into more traditional patterns of soloing, including one nice stretch where just Boyce and Jordan Glenn (drums) took over, really digging their heels in. Johnston pushed the sound outward with a lot of extended tricks — squeaks, air-through-the-horn, plunger-mute antics. It was great stuff, and I found myself thinking these guys would have been a great listen on a more inside, composition-based gig as well. You can follow the Oakland Freedom Jazz Society on Facebook or just keep checking the Duende calendar for upcoming shows. Darren Johnston reappears on Dec. 9, this time with a trio; Michael Coleman’s Sleepover (led by pianist Coleman) will perform as well. 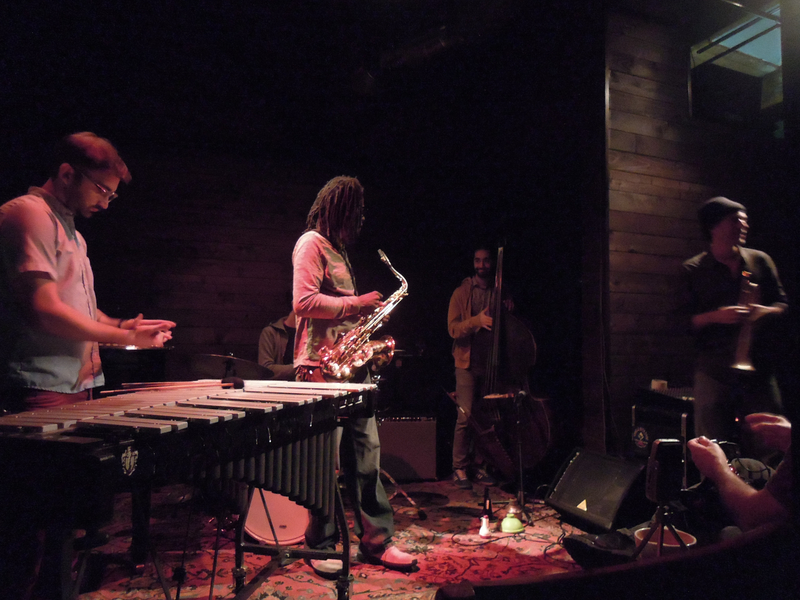 And Vijay Anderson’s trio (is it really his trio, or more a collective thing?) performs on Dec. 23 along with the Aram Shelton Group.